Thank you for purchasing the ADF Leads extension for WP Car Manager. With this extension you can collect customer leads in the industry standard Auto-Lead Data Format (ADF), directly from the listing page. For more information on installing and managing plugins see the Managing Plugins documentation. 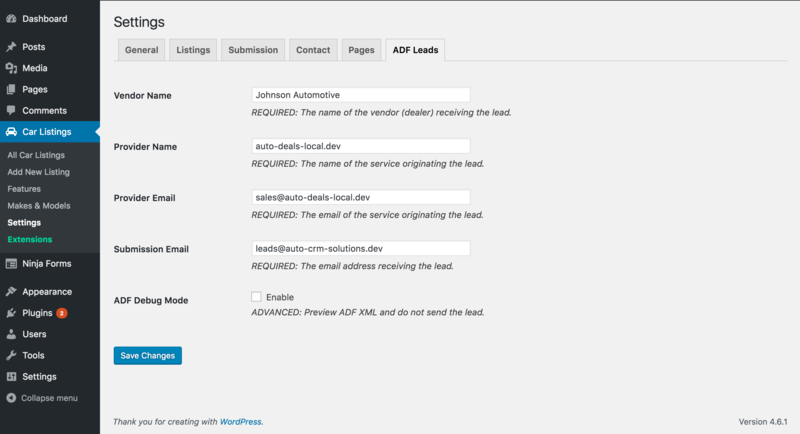 The ADF Leads can be configured in the WP Car Manager settings page (Car Listings -> Settings -> ADF Leads). The name of the vendor (dealer) receiving the lead. The name of the service originating the lead. The email of the service originating the lead. The email address receiving the lead. Once the ADF Lead is configured, you can test the submission by enabling the “ADF Debug Mode” setting. This setting allows you to preview the generated ADF data without sending the email to the configured submission email. When testing is complete, simply disable the “ADF Debug Mode” to continue sending ADF leads. 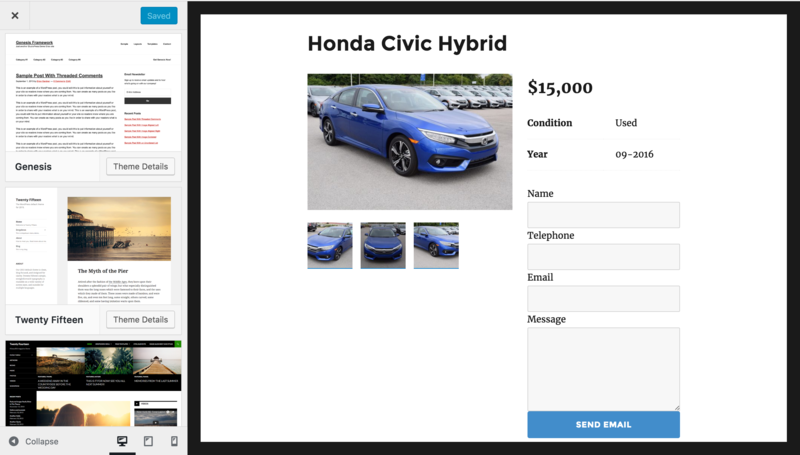 Once activated, the ADF Leads extension replaces the “Email Us” link on the vehicle listing with a lead form for collecting the customer’s name, telephone, email address, and a short message. When submitted, this form generates the ADF lead with the vehicle info, customer info, and provider info, which is then sent to the configured submission email. Does this support my automotive CRM provider? The Auto-lead Data Format (ADF) is an industry standard format for communicating leads between automotive companies. Most automotive CRM providers accept leads in ADF format.